Dave joined FSC as a law clerk during his second semester in law school, and was offered an associate’s position upon graduation in 2010. Since then, he has strived to deliver strong technical expertise, sound legal counsel and effective advocacy. Dave’s educational background gives him a unique understanding of complex technical subject matter, and his legal training serves as his foundation to relate that information in a simple manner. During his time at FSC, Dave has developed a diverse practice area that combines proficient and detailed technical writing with creative and well-reasoned logical conclusions. His practice is focused primarily on intellectual property litigation, with a particular emphasis on patent litigation in the areas of electrical/computer technology, semiconductors, memory design, telecommunications, software, computer architecture, automotive and mechanical devices. He has experience in all phases of litigation, including pre-filing due diligence, discovery management, fact and expert discovery, depositions, wide-ranging motions practice, discovery hearings, claim construction hearings, and trial. He also represents clients in appeals to the United States Court of Appeals for the Federal Circuit. 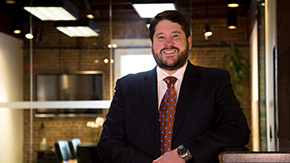 Dave has received several accolades for his work, including being named a Rising Star by Super Lawyers Magazine, a Top Attorney by 360 West Magazine and a Top Attorney by Fort Worth Magazine.